Invisalign® is an innovative way to improve your teeth’s alignment without highly visible metal braces. Invisalign® uses clear, removable aligners to gradually straighten your teeth, without the discomfort of metal brackets and wires. Dr. Lee Frost is a Rutherford Invisalign® dentist who offers clear aligner therapy as a way to straighten your teeth and improve your bite, smile, and self-image. Traditional metal braces straighten teeth and correct bite issues through brackets and wires that are bonded to the front of your teeth. With Invisalign®, patients can correct complex crowding, gapping, and problems with your bite, through a series of clear trays that make slow adjustments to your teeth in a way that's similar to metal braces -- without the visible metal. By scheduling an Invisalign® consultation in Rutherford with Dr. Frost, you can discuss the cosmetic concerns you are hoping to address with your treatment plan. Dr. Frost will take three-dimensional images of your jaw at different angles to get a detailed picture of your teeth and gums. This imaging technology allows you to see how treatment with Invisalign® will change your smile’s appearance over time. Once your treatment map has been laid out, Frost Dental will send your information to Invisalign® so they can create your customized aligner trays to begin straightening your smile. 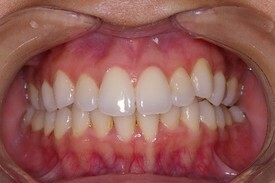 You will wear the clear trays for roughly two weeks at a time, switching to a new set that will gradually move your teeth to the desired position. What Oral Health Issues Does Invisalign® Address? If you have questions about any dental concern, Dr. Frost, your Rutherford Invisalign dentist can examine your teeth and determine if Rutherford teeth straightening with Invisalign® can benefit your smile. Visit our online smile gallery for Invisalign before and after shots of actual patients. How Often Should I Wear Invisalign® Aligners? 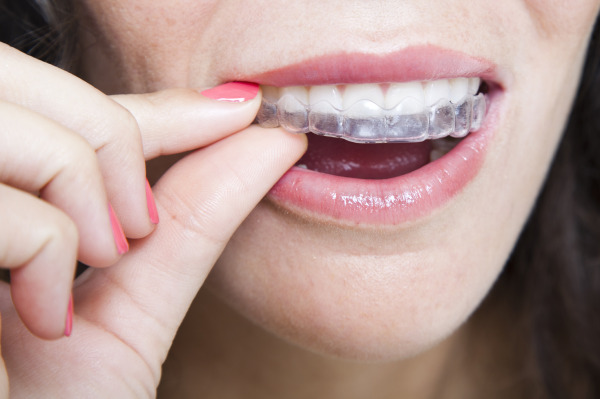 Invisalign® aligners must be worn regularly and for extended time periods to make the necessary adjustments to your teeth; this means wearing the aligners for roughly 22 to 23 hours out of the day. You will remove the aligners when you eat, drink, and brush your teeth, which allows you to keep the same oral health care routine and diet as before you started treatment. Wearing the Invisalign® aligners may take some adjustments at first, but with time you should find they fit seamlessly over your teeth. Because your aligner trays are made from smooth plastic, time spent wearing them is significantly more comfortable than what you would experience with metal braces. How Long Will Treatment with Invisalign® Take? The length of time a person will undergo treatment with Invisalign® depends upon their individual oral health conditions. Typically, you will need between 5 to 15 sets of dental aligners for your upper and lower arches. Wearing them as directed can help you to see the greatest results in the shortest amount of time. Contact Dr. Frost's Rutherford dental office to determine if Invisalign® is the best choice to help you achieve your dream smile. 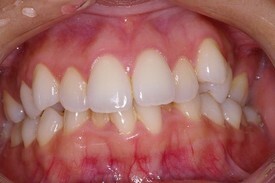 You can also click here to view our Smile Gallery of before and after pictures of patients treated with clear aligner therapy.